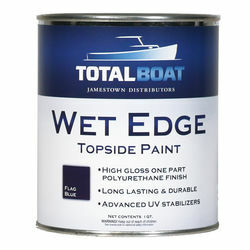 TotalBoat Wet Edge is a one-part, high-gloss polyurethane topside finish. This thick, rich topside paint is easy to apply and has excellent coverage characteristics. Advanced UV stabilizers ensure high gloss and color retention. Choose from 21 popular colors in quarts or gallons. Wet Edge is easy to clean, resists staining, & has incredible abrasion resistance. Our unique urethane formula provides superior adhesion and flexibility, allowing the natural expansion and contraction of your boat's hull without causing the finish to lift or crack. Elasticity provides longer life and increased durability over leading marine one-part enamels. Brush or spray on fiberglass, wood, or previously painted surfaces above the waterline. For best results, prepare surfaces with TotalBoat Topside Primer. Select colors are now available in pints, perfect for boot stripes. TotalBoat Wet Edge Topside Paint is not designed for continuous submersion on boat bottoms that remain in the water longer than 72 hours. (2ea) Wooden Stir Sticks, 10"
What can I use to darken or enrich the color of Fire Red? We only recommend using other wet edge colors to add to a color to change it. Amine blush is generated as an epoxy cures, and is sort of waxy, so paintsetc. will not adhere well.Just wash it as recommended. It is pretty standard to find this. I used TotalBoat Fairing compound and now plan to apply TotalBoat Topside Primer and Wet Edge. Not sure what amine bush is but I take it that the cured fairing compound will have it? How to I prep bare, cured fairing for primer and final coats? The fairing compound does not blush, just sand with 220 grit and apply the primer. What Total Wet Edge Topside color would be equivalent to Awl Grip Matterhorn White? Sorry, we don't have a Wet Edge match to Matterhorn White. Yes it will be careful, this paint seems to run very easily. You must rolland tip this paint or it will be a mess. We don't have a single part clear coat available that could go over the top of the Wet Edge Flag Blue. It should be very glossy when dry. You can compound out any slight defects and protect with a coat of wax. Wait at least a week and be sure the paint is fully cured and hard before wet sanding or compounding. Sand between coats with 220- 320 grit. I am in the process of painting my 1977 catalina 22 sailboat. The hull has been primed and painted with interlux 1 part epoxy paint. For the non-skid, I have decided to use rubber particles from softsandrubber.com sprinkled onto the wet paint. please recommend which of your paints to use for this application. I would also like to go with a semi-gloss (flatter) finish for the non-skid, versus the glossy finish. The wet edge in flat white will work well for that. North Carolina is 2 to 3 business days shipping time. I have a 13 ft 1978 Boston Whaler and I am getting ready to restore the boat. I am looking for a bottom paint for the boat and would like a recommendation please. Also with the wet edge top paint, will a quart be enough top complete the top? A quart of Totalboat Spartan will do the bottom.You will need 2 quarts of Wet Edge to do two thin coats. The paint is great...the can...not so much. Excellent top paint that conceals and covers well. Just be careful of the handle on the paint can since, in my case, with the lid off and carrying the can to the boat, the handle broke free from the one side of the can. You can imagine the mess. Fortunately it broke just as I raised it over the transom so at least the spillage was inside the boat that was being painted anyhow. Used this to repaint my pontoon with excellent results. The paint was the exact viscosity needed for our project, no thinning required. This was the first time I used Wet Edge. I rolled the paint on my Adirondack Guideboat and tipped with a badger hair brush.The paint did not smooth out after tipping like other paints that I have used.Next time I will thin the Wet Edge paint and see if that helps. Perfect for motorcycle track bodywork too!!! I work seasonally for a Harbormaster department on Cape Cod and am quite familiar with turning our fleet of boats from tired looking work horses to showroom grade masterpieces using various brands of topside paints, but mostly the Petit brand.My hobby is doing track days with my sportbike motorcycles and after an early season mishap, I was ready to paint a full set of new fiberglass fairings/bodywork. I know I might destroy the bodywork again or even worse, so I was not looking to pay upwards of $1,500 to have the bodywork professionaly painted. I have plastidip'd an entire bike in the past and it's perfect for track use but that stuff hates gasoline drips or solvents touching it. I was looking for something cheap, good DIY'er application, and durable. Using topside paints at my Harbormaster job caused me come up with the great idea to try the paint application we use on the boats for my latest motorcycle bodywork project.I settled upon Totalboat Wet Edge after a recommendation from a coworker who was restoring an old 13' Boston Whaler. And the price for a quart was well within my budget.I read a lot of reviews here and also had my own trial and errors until I discovered what worked best for my use/needs.Prep: I found wet sanding at 320 grit was good for roughing up the bodywork primer and knocking down any flaws in the panels. I then cleaned the bodywork with alocohol or mineral spirits, let that evaporate, then go over all of it with a tack cloth, ready for painting.Painting: I found just rolling with a mini-foam roller was all that was necessary for me. Experimenting revealed that after 48 hours of curing, I could wet sand down to super fine grits of 1500 and 2000 and then attack the pieces with my orbital buffer and achieve a perfectly level and high gloss finish. I ultimately settled on thinning with 10% mineral spirits and applying a thick last coat with the roller. It cured nearly level and better than some automotive finished churned out these days.